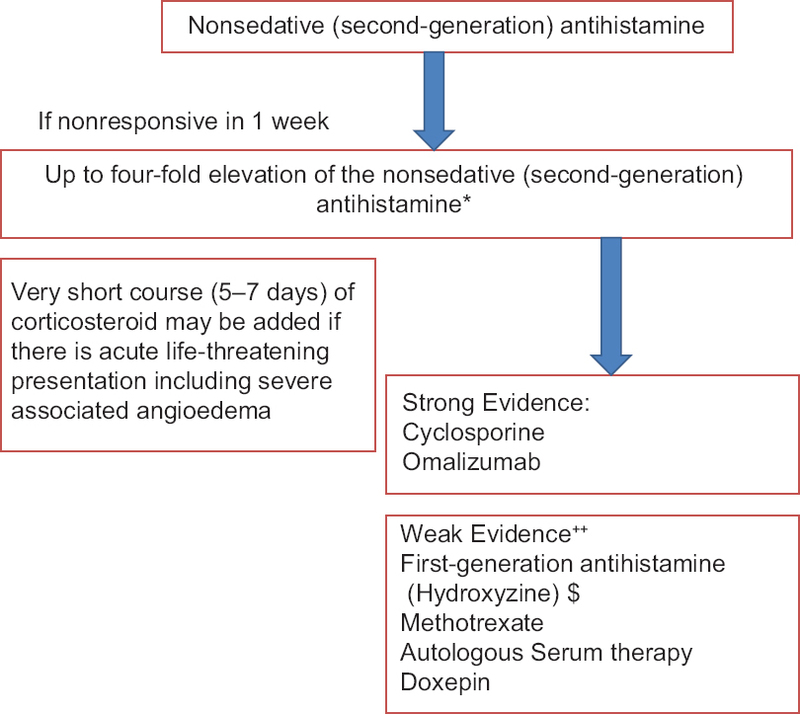 This article is developed by the Skin Allergy Research Society of India for an updated evidence-based consensus statement for the management of urticaria, with a special reference to the Indian context. This guideline includes updated definition, causes, classification, and management of urticaria. Urticaria has a profound impact on the quality of life and causes immense distress to patients, necessitating effective treatment. One approach to manage urticaria is by identification and elimination of the underlying cause(s) and/or eliciting trigger(s) while the second one is by treatment for providing symptomatic relief. This guideline recommends the use of second-generation nonsedating H1-antihistamines as the first-line treatment. The dose can be increased up to four times to meet the expected results. In case patients still do not respond, appropriate treatment options can be selected depending on the associated medical condition, severity of the symptoms, affordability of the drugs, and accessibility of modern biologics such as omalizumab. Causality assessment essentially means finding a causal association or relationship between a drug and drug reaction. Identifying the culprit drug or drugs can be lifesaving or helpful in preventing the further damage caused by the drug to our body systems. 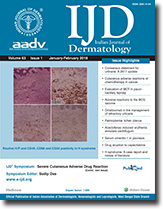 In dermatology practice, when it comes to cutaneous adverse drug reaction, this is much more important and relevant because many aetiologies can produce a similar cutaneous manifestation. There are multiple criteria or algorithms available as of now for establishing a causal relationship in cases of adverse drug reaction (ADR), indicating that none of them is specific or complete. Most of these causality assessment tools (CATs) use four cardinal principles of diagnosis of ADR such as temporal relationship of drug with the drug reaction, biological plausibility of the drug causing a reaction, dechallenge, and rechallenge. The present study reviews some of the established or commonly used CATs and its implications or relevance to dermatology in clinical practice. Acute generalised exanthematous pustulosis (AGEP) is a severe cutaneous adverse reaction and is attributed to drugs in more than 90% of cases. It is a rare disease, with an estimated incidence of 1–5 patients per million per year. The clinical manifestations characterised by the rapid development of sterile pustular lesions, fever and leucocytosis. Number of drugs has been reported to be associated with AGEP, most common being the antibiotics. Histopathologically there is intraepidermal pustules and papillary dermal oedema with neutrophilic and eosinophilic infiltrations. Systemic involvement can be present in more severe cases. Early diagnosis with withdrawal of the causative drug is the most important step in the management. Treatment includes supportive care, prevention of antibiotics and use of a potent topical steroid. Drug reaction with eosinophilia and systemic symptoms (DRESS) syndrome, is also known as drug induced hypersensitivity syndrome and by various other names. It is now recognised as one of the severe cutaneous adverse reaction (SCAR) and can be potentially life-threatening. Historically, it was most frequently linked with phenytoin and was initially described as phenytoin hypersensitivity syndrome. However, it was later found to be caused by various other medications. Anticonvulsants and sulfonamides are the most common offender. Characteristically DRESS has a latent period of 2 to 6 weeks. The pathophysiology remains incompletely understood but involves reactivation of viruses and activation of lymphocyte. It is manifested most commonly with a morbilliform cutaneous eruption with fever and lymphadenopathy. The severity of this syndrome is related to the systemic involvement, which can result in multi-organ failure. Most important step in the management of DRESS is early diagnosis and immediate cessation of the suspected offending drug. Patients of DRESS syndrome should be managed in an intensive care set up for appropriate supportive care and infection control. Topical corticosteroids can give symptomatic relief, but systemic therapy with steroid and other immunosuppressant is usually required. Background: The diagnosis of cutaneous adversities in the cancer patient is especially difficult, given the complexity of their illness and combination protocols used for the treatment. The present study was undertaken to know the spectrum of cutaneous adversities in patients undergoing chemotherapy and the drug(s) most commonly associated with it. Materials and Methods: A total of 1000 patients with malignancies under chemotherapy in the oncology ward and outpatient department were screened in this observational study from January 2013 to February 2015. Relevant investigations for diagnosis of malignancies under chemotherapy and dermatological disorders were carried out. Results: Three hundred and eighty-four patients presented with cutaneous adversities of chemotherapy. The most common was anagen effluvium (78.6%), followed by xerosis (4.4%), thrombophlebitis (3.1%), generalised pruritus (2.9%), melanonychia (2.9%), hand-foot syndrome (2.6%), extravasation reactions (1.8%), flagellate dermatosis (1.3%), prurigo nodularis (0.8%), exfoliation (0.5%), ichthyosis (0.5%), papulopustular rash (0.3%), bullous photodermatitis (0.3%), and Sweet's syndrome (0.3%). Chemotherapeutic drugs were mostly given in combinations. 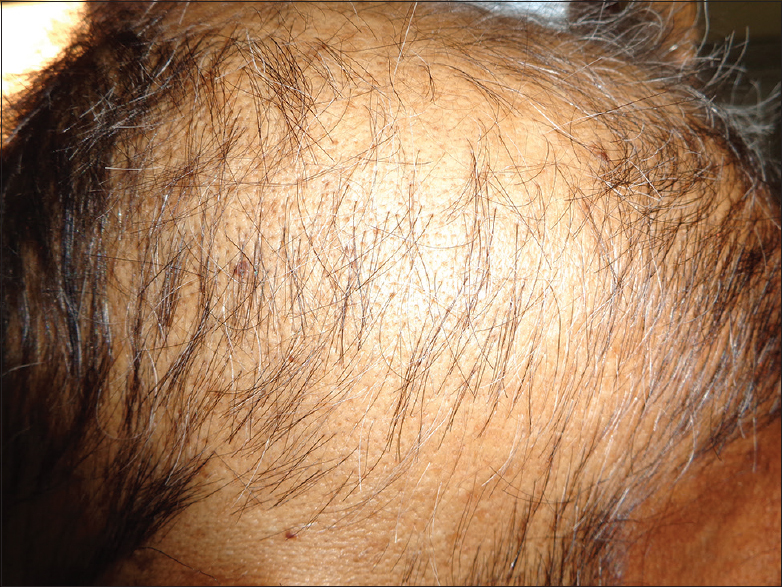 Most common drugs to cause anagen effluvium were alkylating agents in combinations, hand-foot syndrome by taxanes (docetaxel), flagellate dermatoses by antitumour antibiotics (bleomycin), and exfoliation by antimetabolites (methotrexate). The limitation of this study was to imply a specific drug as the causation of the cutaneous adversities since the chemotherapy mostly consisted of combination protocols. Therefore, we have tried to associate the drug combination itself. Conclusion: Chemotherapeutic drugs produce a range of cutaneous adversities, certain specific adversities pertaining to drugs, and their combinations have been implicated which should be looked for and managed accordingly. Knowledge of the adverse effects of anticancer drugs will help reduce the psychological trauma and improve the quality of life. Background: At present, the WHO recommends fixed duration multidrug therapy (FD-MDT) for the treatment of leprosy, in which treatment is provided for a fixed duration regardless of clearance of skin lesions or bacterial status of the patient. There is divided opinion regarding the efficacy of FD-MDT; especially for paucibacillary Hansen's disease, in which treatment is provided for 6 months. In addition, there is a paucity of literature on clinical and histopathological features of treated leprosy. Objectives: The objectives of this study were to prospectively observe the effects of MDT on clinical and histopathological features in paucibacillary leprosy and to assess the efficacy, safety and tolerability of MDT-paucibacillary (PB) regimen. 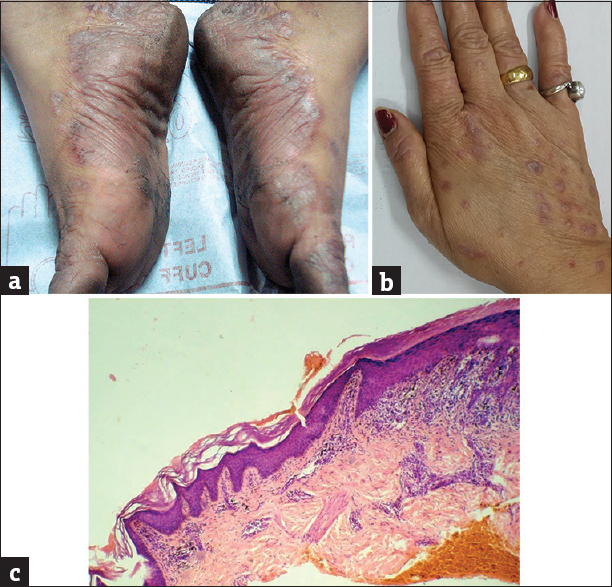 Materials and Methods: A total of 52 new cases of PB leprosy diagnosed by clinicopathological correlation and slit skin smear were administered standard WHO PB-MDT for 6 months. Patients were reviewed at 3rd month and 6th month of therapy and 3 months posttherapy for their clinical and histopathological assessment. Results: Among 52 new cases of PB-leprosy 43 patients (mean age 31.74 ± 12.2 years, m:f 1.53:1) completed the study as per protocol. Fourteen percent patients recovered completely, 76.7% patients had a residual patch at the end. Number of lesions reduced significantly 2nd follow-up onwards while the lesional size showed significant decrease 1st follow-up onward. Nerve palpability also reduced significantly at treatment completion. Histological improvement was appreciable; lymphocytic infiltration reduced significantly 2nd follow-up onward and presence of granuloma 1st FU onward. Only four patients complained of occasional, uneventful epigastric pain during the study. Conclusion: Although the frequency of persistence of lesions after completion of therapy was high, histological evidence of activity was present in a minority (7%). Thus, the standard WHO MDT-PB regimen was found to be effective, safe and well-tolerated. Background: Tinea versicolor (TV) is characterised by the appearance of maculosquamous lesions sometimes associated with mild erythema and pruritus in characteristic areas of the body. Eberconazole and terbinafine though drugs of different classes provide both mycological and clinical cure. Aim: This study aims to compare the efficacy and safety of eberconazole versus terbinafine in patients of TV. Materials and Methods: An open-label, randomised, comparative clinical trial was conducted on 60 patients. The patients were randomly divided into two study groups. Group A: Eberconazole 1% cream once daily and Group B: Terbinafine 1% cream once daily for 2 weeks. Efficacy assessment was done by observing signs and symptoms, i.e., Physician assessment 4-point scale, microscopic KOH examination, Wood's lamp examination, global clinical response assessment, and patient's assessment on visual analog scale at the end of 2 weeks and subsequently patients were reassessed at the end of 4 and 8 weeks to check any relapse. Safety assessment was also done. Results: There was a significant improvement in all the parameters in both groups over a period of 2 weeks. 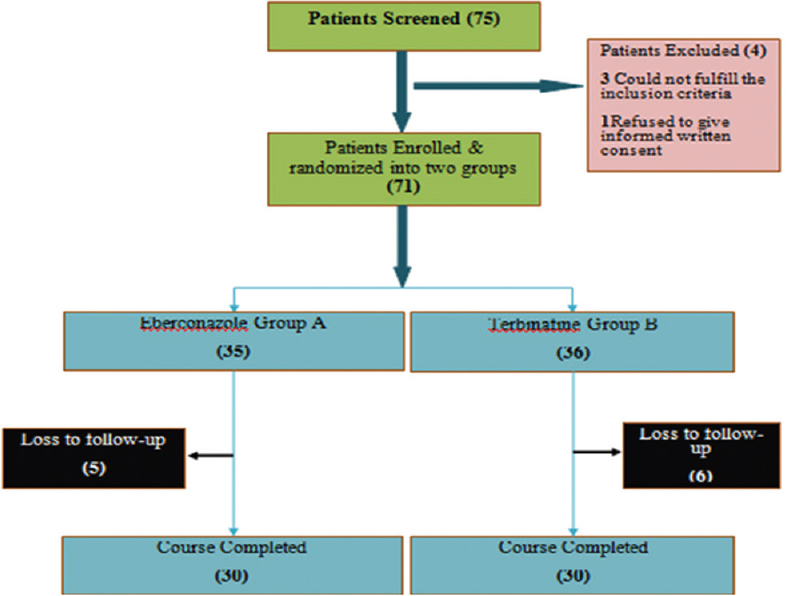 Both the treatment groups, i.e., eberconazole and terbinafine were found to be safe and efficacious at the end of 2 weeks, and no statistically significant difference was observed between the two groups regarding complete cure, i.e., mycological and clinical cure (80% vs. 63.33%), respectively. However, early response (at the end of week 1) was observed with eberconazole. No relapse was seen with eberconazole, but one patient had relapse at 8 weeks with terbinafine. Both drugs had similar safety profile. Conclusion: Although both the drugs cured the disease, eberconazole showed better response as clinical cure and mycological cure were observed earlier and no patient relapsed in the follow-up. Introduction: Palmoplantar lesions of lichen planus (LP) are uncommon and may not always have classical clinical features of LP. A variety of morphological types has been described in literature. Aim and Objectives: The aim was to study and classify the clinical variants into distinct easily recognisable categories for quick recognition and early treatment initiation. Methods: All patients diagnosed with LP over a period of 5 years were evaluated for palmoplantar lesions in our hospital. 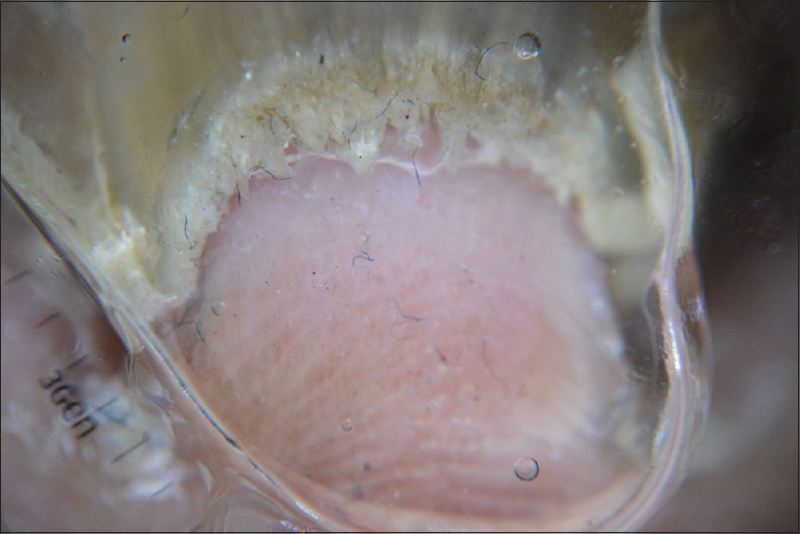 The clinical and histopathological features of the palmoplantar lesions were then studied. Results: Out of 424 patients of LP, 55 (12.9%) had palmoplantar lesions. Histopathology was consistent or at least compatible with LP in 44/55 patients. For the purpose of assessment, only patients with histopathology consistent with LP were included (n = 44) in the study. Just over half of the patients were male, with most patients (43.2%) having had LP lesions elsewhere for 6 months before palmoplantar lesions were noticed. Soles were more frequently involved than palms. The sites most often involved were the centre of the palms (45.2%), and the instep of the soles (63.9%). The predominant morphological presentation was psoriasiform (47.7%). One patient had ulcerative lesions of LP on both his soles which is a very rare variant. Notably, nearly half of the patients (20/44) had mucosal (mostly oral) lesions characteristic of LP. This was significant as typical oral lesions of LP help in identifying palmoplantar lesions that do not have classical lichenoid morphology. 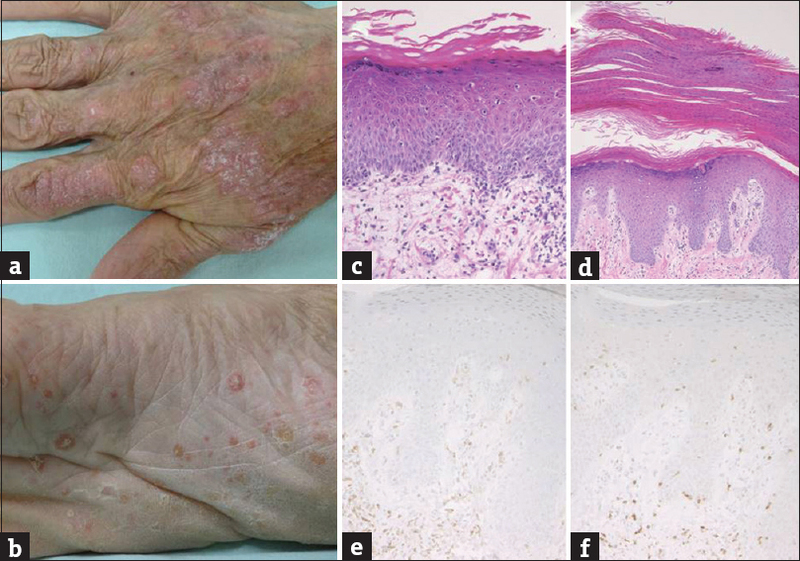 Conclusion: LP lesions on palms and soles need to be identified keeping a high index of suspicion and differentiated from other papulosquamous conditions so that specific treatment can be initiated early. Background: Bacillus Calmette-Guérin (BCG) vaccine is a widely used vaccine. Management of local BCG complications differs between clinicians, and the optimal approach remains unclear. Aims: We aim to describe the epidemiological, clinical and therapeutic aspects of the BCG vaccine side effects in Sfax. Patients and Methods: This was a retrospective study of all the cases of BCG vaccine adverse reactions recorded in the Dermatology and Paediatrics Departments of Hedi Chaker University Hospital of Sfax over a period of 10 years (2005–2015). Results: Twenty cases of BCG adverse reactions were notified during the study period. Actually, 80% of the patients presented local adverse reactions. The outcome was good in all the followed patients. The rate of disseminated BCG disease was 20%. Biological tests of immunity showed a primary immunodeficiency in three cases, whereas the outcome was fatal in two cases. Conclusion: BCG vaccine adverse reactions range from mild to severe. However, the management of benign local reactions remains unclear. Disseminated BCG disease must alert clinicians to the possibility of a primary immunodeficiency. Aim: To study the effects of omalizumab in chronic spontaneous urticaria in Indian patients. Setting and Design: The study was conducted in a tertiary care centre and it was retrospective and descriptive in nature. Material and Methods: We analysed the data of patients who were administered omalizumab between June 2014 and June 2015 for the management of refractory chronic spontaneous urticaria at our centre. Omalizumab was used in those patients who did not respond to updosing of antihistaminics and cyclosporine. Omalizumab was used in dose of 300 mg per month for 3 doses. Results: Twenty-four patients were administered omalizumab during the study period. Average age of the patients was 36.54 years, female:male ratio was 1.4:1, mean duration of disease was 20.66 months, and autologous serum skin test was positive in 33% of studied individuals. Ninety six percent of cases showed response to treatment in our study. Remission was seen in 25% of patients, 50% showed satisfactory response, and 20.83% showed partial response. Average UAS7 scoring before starting omalizumab in preceding week was 24.4. 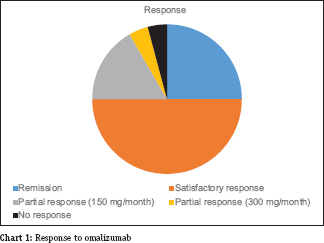 Average UAS7, 2 weeks after starting omalizumab was 4 in responsive patients. Conclusion: Omalizumab is safe and effective treatment for the management of chronic spontaneous urticaria. It can be used in Indian setting after failure to other third-line therapies such as addition of montelukast and cyclosporine due to high cost of treatment. Erythema annulare centrifugum (EAC) is characterised by slowly enlarging annular erythematous lesions and is thought to represent a clinical reaction pattern to infections, medications, and rarely, underlying malignancy. Causative drugs include chloroquine, cimetidine, gold sodium thiomalate, amitriptyline, finasteride, etizolam etc. 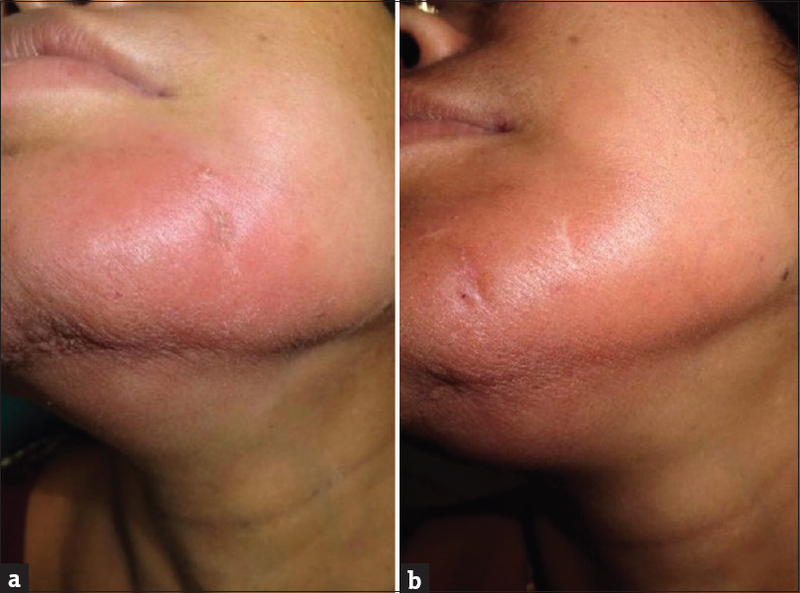 We present a case of 40-year-old woman who presented to us with a 10 days history of nonpruritic, peripherally growing annular erythematous eruption. She had a history of recent onset of joint pain, for which she was taking aceclofenac 90 mg once a day for 5 days prior to the onset of the rash. This was confirmed on biopsy as EAC. The rash promptly subsided after stopping the drug. We report this case as there was no previous report of aceclofenac induced EAC. Cutaneous leiomyomas (CLs) are uncommon benign smooth muscle tumours characterised by solitary or multiple painful nodules. Based on origin, three types are recognised, namely piloleiomyoma, dartoic leiomyoma, and angioleiomyoma, with piloleiomyomas being the commonest one. Reed's syndrome also known as multiple cutaneous and uterine leiomyomatosis (MCULs) is characterised by CLs in men and CLs and uterine fibroids in women. Association of Reed's syndrome with renal cell carcinoma is labelled as hereditary leiomyomatosis and renal cell carcinoma (HLRCC). Both MCUL and HLRCC are caused by a heterozygous mutation in the fumarate hydratase gene. Besides renal cell carcinoma, there were extremely rare reports of association of MCUL with benign renal lesions. We report a case of a 55-year-old female with segmental tender papulonodular lesions suggestive of leiomyoma associated with uterine leiomyomas and unilateral renal cyst. The case is reported here for its rarity and uncommon association with asymptomatic benign renal cyst. H syndrome is a rare autosomal recessive syndrome characterised by constellation of clinical features and systemic manifestations including cutaneous hyperpigmentation, hypertrichosis, hepatosplenomegaly, hearing loss, heart anomalies, hypogonadism, hyperglycaemia, low height, and hallux valgus. We report a case of this syndrome with typical clinical findings. We report this case citing the rarity of this uncommon entity. The hyper-IgE syndrome (HIES) is a rare group of primary immunodeficiency characterised by recurrent infections, eczema, and elevated serum levels of IgE. Autosomal dominant HIES is caused by mutations in transcription factor – signal transducer and activator of transcription-3. Autosomal-recessive (AR) HIES was described in 2004 due to mutation of tyrosine kinase 2 gene, and subsequently, another mutation in dedicator of cytokinesis 8 gene was discovered in 2009. Although both the forms have many common clinical features, few characteristic findings help in differentiating them. 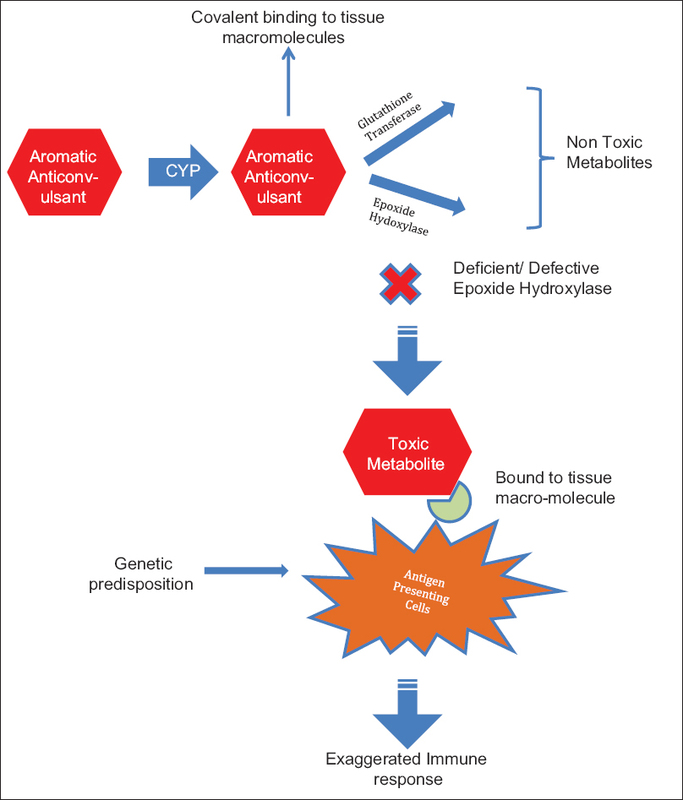 AR-HIES is characterized by recurrent bacterial and viral infections, atopic eczema, and raised serum IgE levels. We report a case of a 4-year-old girl presenting with the features of AR-HIES to highlight the presentation of this rare disease.